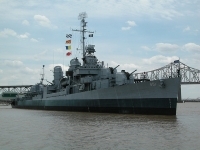 A highlight of the Baton Rouge Nautical Center and USS Kidd Veterans Museum is the restored 369ft (112m) World War II Fletcher Class Destroyer, USS Kidd (once known as the 'Pirate of the Pacific'), which is the prime exhibit. The ship is a National Historic Landmark and a memorial to the US veterans of World War II. Overnight camping experiences on the ship are offered, while the centre also features a huge collection of model ships, a restored World War II fighter plane, a jet fighter from the Vietnam era and a walkthrough exhibit of the gun deck of Old Ironsides. Lovers of military history, and naval history in particular, will relish this attraction.